The budget you have in place is serving its purpose. You’re saving money each month for your emergency fund, one-off expenses, and a myriad of other things you want to do in life. You’re curbing debt that has crippled your cash flow in the past. By all accounts, it seems that you’re on track to meeting your financial goals. Are you opting to build wealth by applying money to a growth vehicle – effectively, letting your money work for you? In other words – are you investing? Maybe you don’t understand the concept of investing, because heck, why would you want to “gamble” with your hard-earned money? Today I’ll provide some insights on saving vs. investing and examples to get you familiar with the process. As an added bonus, I’m including a view of how the investment process is helping me reach my money goals. Saving money is great for the short-term. At ~1% yield, it is merely a way to have access to funds FAST. Investing takes it one step further where you trade stagnant growth for more risk and potentially more return. Let’s compare the two with the following situations. Farmer A plucks a fruit off his tree and stores it in the barn. Next week he does the same thing. He continues this process again and again. This is essentially the premise behind saving your money. It accumulates slowly and steadily over time. Farmer B plucks a fruit off his tree. He cuts it in half. One half is put in the ground with the seeds. The other half is stored in the barn. He notices a tree sprout in the ground from last week’s planting. In the 3rd week, he has 2 sprouts and 1.5 lemons stored. You see, at the cost of the amount saved and accessible, he is investing in potential. Over time he will have a robust orchard of fruit trees, each one producing many more fruits than he gave up from his initial savings. This is essentially the premise behind investing. Money grows as it accumulates, and the more it accumulates, the faster it grows. The type of investment I am focusing on within this article relates to the stock market. These types of investments may have a place in your investment portfolio, either through your workplace or personal accounts. Investing is quite simply the process of putting your money in a position to grow – like the fruit trees. When you invest, you expect that the money outlaid will earn you a profit in the form of market growth, capital gains, dividends, etc. To give you an idea, S&P 500 investing over the last 30 years (1987-2017) has resulted in historical annualized returns of ~7%. In a given year, the returns may be higher or lower than ~7%. When you invest, you are sending a certain amount of your money out to work for you. However, there is always a chance that it won’t come back at all. That’s the risk you take when you invest. In my case, this did not paralyze me or prevent me from taking the eventual jump. I knew that I could use basic methods of investing and still potentially make more money than what regular savings would offer me. It’s natural to fear losing your hard-earned money. Though, not all investments carry the same level of risk. Generally, if you are seeking a high return there will be more risk. Inversely – low return, low risk. There are a myriad of ways to manage risk. For a long-term investor here are a few things to consider. AKA – don’t put all your eggs in one basket. Hold different types of stocks, bonds, sectors, types, funds, etc. As a long-term investor, it can be “boring” and still get the intended results. Don’t be intimidated by investment speak that the pros/active traders use. A buy and hold strategy is generally less risky because it takes a long-term approach. Fluctuations and corrections are less likely to affect your big-picture goals. Money is not lost until the loss is solidified. When you hear about people losing money in the stock market, it’s because they chose to accept the loss. They sold their investments and made the losses realized. Paper losses turned into financial losses. Perhaps they were afraid of further devaluation, but they weren’t considering potential rebounds and gains further down the line. This is a short-term mindset in a long-term plan. You own a home that you purchased for $100k. A highway is built nearby, decreasing your home value by 10%. Why? Because you haven’t sold your home. No papers have been signed. As of right now, nothing has changed except your home’s value is down. Let’s say you decide to rent out your place to mitigate any losses that you may incur as a result of the sale. The rent received each month covers your monthly mortgage payments and renting fees, and there’s even an excess of $250/month that you can pocket as rental income. In this scenario, revenue before taxes is $3,000 per year. In under 4 years, you have offset the $10,000 loss that you would have incurred by selling your home at its lower value. Even if the home value never rebounds, you have negated the loss. That’s a similar way of viewing equity investments. There will be fluctuations, but overall returns will be based on what you decide to do when the market takes a downturn. Looking for a financial tool to manage your finances? Check out Personal Capital. I have used it for a number of years and it is one of my go-to’s. Learn more about it by reading my article here. I go into the process knowing that there is risk, (my fruit tree could die) but there is reward as well (oodles of fruits). With many of my money-related decisions, I have goals. My ultimate end goal is to accumulate enough funds to be financially independent and redefine my 9-to-5 – someday. In my mid-20’s, I mapped out a long-term plan of purely savings. Recently, I reviewed my forecasted savings compared to a combo of savings and investments for 2014-2017. The following chart gives you a view of what occurred when I changed my long-term wealth strategy from saving to stock market investing. The columns shown for “Saving” are based on forecasted numbers including estimated contributions. 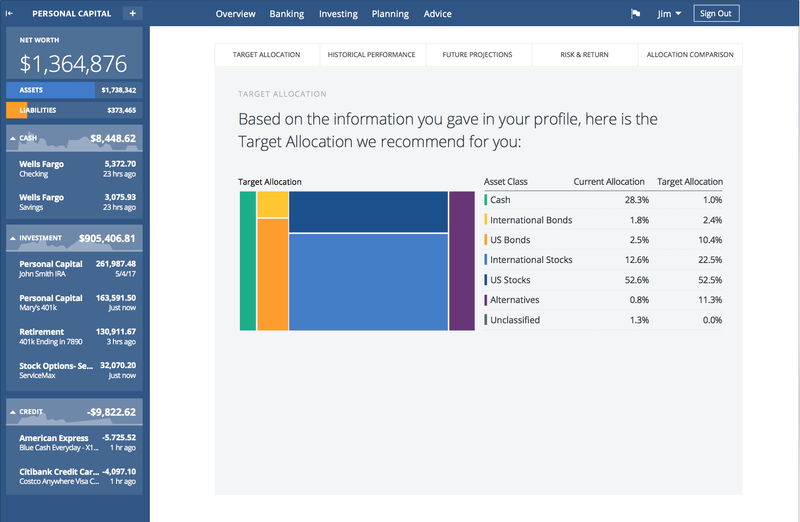 The “Investing” columns are taken from actual figures and include savings and invested balances. This is not meant to represent that investing my money gave me 100% returns (what it looks like). It’s meant to give you an idea of what occurs when wealth is accumulated by abiding by an earning power + saving power + investing power formula. Within this period a few things occurred. #1 – My highest HH earning years were 2014 + 2015 + 2016. #2 – An average savings rate of ~50% was achieved during this time period. #3 – The majority of recurring savings was invested in the stock market. #4 – In 2016, I lost my job. #5 – 2017 was down to one HH income and hit the next 100k milestone. Had I not taken a long-term approach to investing my money, it would have resulted in meager yearly increases. The power of investing has helped me meet my money goals and will continue to be part of my wealth building equation. Investing can be overwhelming, especially when you are just beginning. A healthy fear of loss is a good thing though, as it ensures that you will perform the proper due diligence in making your investing decisions. The fear is unhealthy if it prevents you from investing altogether, as this can greatly limit your growth potential. The potential rewards are there, so the primary concern now is to reduce risk. Earlier, I mentioned some areas to consider. In my case, along with following some of those guidelines, I made sure to only buy what I understood. When everything is in place and running smoothly, you will have a self-sustaining system which can maintain its growth even in the event that you are unable to contribute fresh capital for a certain period of time. In the end, adding investments to your financial plan is the motor behind the machine which powers your finances and pushes you toward your goals. Full-Time Dollars (FTD) is dedicated to providing insights and resources to help you achieve your financial goals. Ebates – receive $10 when you spend $25 (online/in-store shopping). Ibotta – receive $10 as a welcome gift (grocery in-store shopping). Personal Capital – take a screenshot when you hit your first $1M. Visit my resources page for more information on each service and to view other offers! Readers, if you are a beginner investor – what gave you the push to move from saving to investing? If you are a seasoned investor leave your words of wisdom! Great post and I also like the emphasis on facing the fear of investing. Indeed – that was a mistake I made in my early 20s, squirreling away my earnings – yes, like a squirrel hoarding nuts for the winter! It wasn’t until I embraced the term – make your money work for you, to be like putting little soldiers (dollars!) out to battle. Some made it home. Some did not. Horrible analogy maybe I just did there. But – i grieved and learned from the losses! Hey Mrs. DS – Absolutely, investing doesn’t have to be intimidating. Learn, implement, stick to the plan! Thanks for stopping by. Definitely – and without risk there’s no reward. Emphasizing the difference between saving and investing is so important. Saving money is great, but it’s hard to get ahead without having the markets working for you and helping you build your net worth. Plus, when you factor inflation into the mix, savings accounts will have a hard time even breaking even. Hi Sarah – Back in my mid-20’s I wish I was more intentional with investing. Though, at the time I thought I was working until 65+! Life changes unexpectedly sometimes. Saving vs. Investing is significant. The faster that’s learned, the faster wealth can be built! Thanks for adding your input! I think you have covered all the basics. This should be mandatory part of your financial education. Hey there – It’s a prelim to get started and the necessary component to build wealth. Hey HP! Great information here! Investing is crazy scary, especially after witnessing the 08 crash. I started investing in my 401k, and opened a Roth IRA, which has eased the fear of investing quite a bit! Next stop- an investment account that isn’t tax sheltered. It’ll be new, scary territory, but this post made me feel a little bit better about the endeavor. Hi Steph! I started out just like you with first a 401k and then a Roth IRA – and eventually ventured into taxable accounts. Within those latter accounts I invested very similarly, but with different funds and brokerages. Sadly, lacking a job has me missing putting money away like before – this shall change someday! Thanks for stopping by!